On April 9, 2019 I was invited to participate in a very interesting panel organized by the OISE’s (Ontario Institute for the Studies in Education) Science, Mathematics and Technology (SMT) Centre and the Canadian Science Education Research Group (SERG). These two organizations co-hosted this cross-Canada forum titled: STEM in Teacher Education – A Canadian Perspective. The panel was videotaped and I hope it will be of interest to many mathematics and science educators who are trying to understand what STEM means in the Canadian context. For me, it was especially interesting to think about the challenges of the STEM construct itself, its history and its future. I also tried to think how we educate our teachers and if we can expect from them to be able to teach in the way that STEM education suggests. The summary by Prof. David Blades was especially interesting. I hope my students will find it illuminating as well. Over the last decade or so, the STEM acronym has gained momentum as a hot new term in educational and public spheres in Canada. Despite the term’s ubiquity, education systems have been slow to formally identify ways in which we should approach STEM education, much less how we should conceptualize what STEM means in a Canadian context. Meanwhile, teachers are being prepared for classrooms where they are expected to introduce the STEM construct to their students. In the cross-Canada forum STEM in teacher education: A Canadian perspective, panelists and audience members will explore ways in which teacher educators in Canada are preparing pre-service teachers for this new avenue of teaching and learning while examining the potential challenges and affordances attending STEM education. Carol Rees, Thompson Rivers University. Moderator: Doug McDougall, OISE, University of Toronto; Editor-in-Chief, Canadian Journal of Science, Mathematics and Technology Education. I wish this news were shared with the world on a global scale! This is huge! My colleagues and I have been working for month on organizing the next STEM in Education Conference here at UBC in the summer of 2020. This is the second time we will be hosting this conference here in Vancouver. This international conference is the result of the original collaboration between three universities: Queensland University of Technology (Brisbane, Australia), Beijing Normal University (China) and UBC. Now we have more partners and many K-12 teachers, STEM educators, STEM education researchers and educational leaders are planning to attend it. We are working on making it an exciting and productive conference for all the participants. Please check our website: http://stem2020.ubc.ca/and share it with your colleagues. 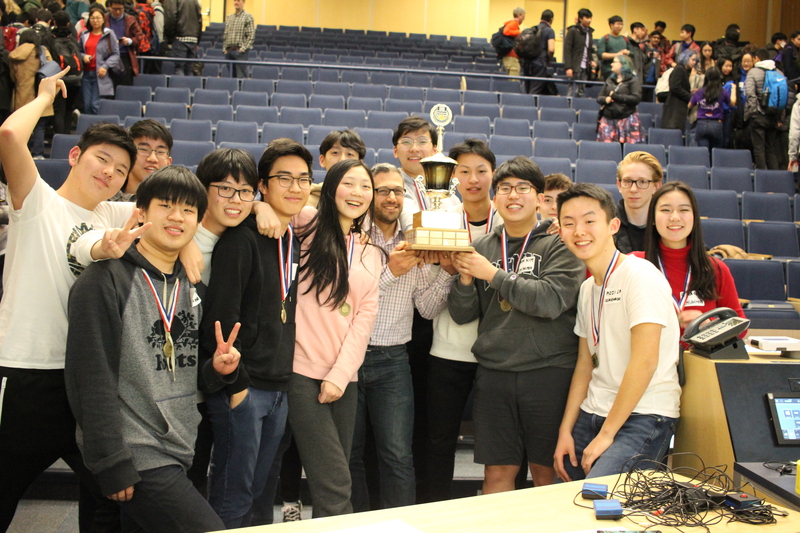 This Saturday, on March 9, 2019 we held our 41st UBC Physics Olympics. More than 730 BC secondary students participated in the events. 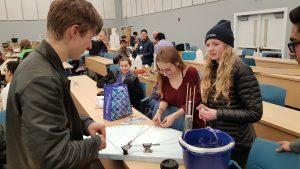 They represented 72 teams from all over British Columbia who worked tirelessly for months to create their pre-builds, prepare for the Fermi Question and Quizzics competitions, and get ready for the hands-on labs. We had teams from Vancouver Island, Nelson, Invermere, Kelowna, Whistler, Squamish and many other areas of BC. While the majority of the teams came from the Lower Mainland, many regions of BC were represented. While organizing and leading hands-on events for 734 students was a huge time and effort investment on behalf of the volunteers, faculty, students and their teachers, it was all worth it. I cannot even express how amazing it is to see so many teams figuring things out, working together and enjoying doing physics. For many students it was the first time they came to UBC do to physics. Thanks once again for all of the work you and your colleagues put into this event. Not only did my students have a great time, but it was a wonderful opportunity to boost their confidence. They tend to think that they have no chance at competing with “city kids” and don’t expect to succeed, but they are feeling a lot more positive about themselves and their futures at university now! Students are working on their timepiece. They had to design a device that can measure any given small time interval. I also have to admit that I felt a little bit like “a physics grandmother” at this event. My own former students, who are now wonderful physics teachers all across BC came with their teams to compete. This was very special. I had ten of my former students in the event! Students from Semihamoo Secondary School and their teacher Mr. Louay El Halabi celebrating their overall win – the big trophy is theirs for one more year! I would like to thank all the volunteers, organizers, teachers and students who made this celebration of science possible! We are looking forward to the 42 event in 2020! 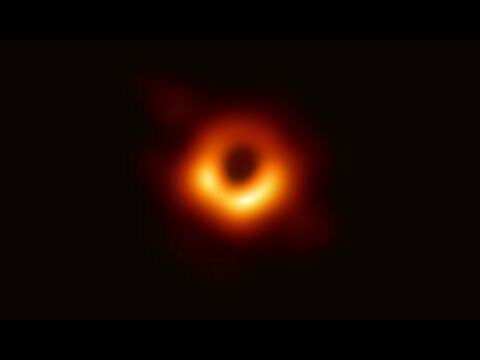 For the past half a year, my colleagues from the Department of Physics and Astronomy and I have been working together on organizing the 41st UBC Physics Olympics. This is an annual event that has become a tradition. It is also a unique opportunity to bring together physics teachers from all over British Columbia. I am proud to say that some of the physics teachers who bring their teams are my former students. This year, we are expecting 73 teams of students from all over British Columbia. 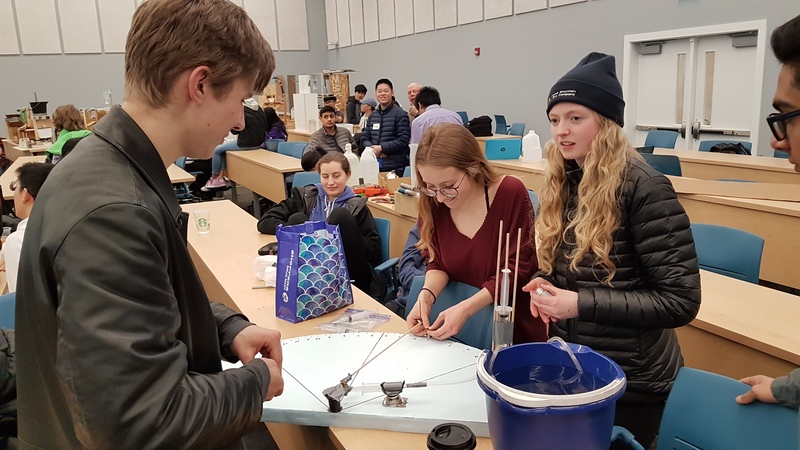 This means that we will have more than 600 students from British Columbia (most of them are grade 11-12 students) who will come as teams to compete in hands-on events. This is a very unique event and only a collaboration of many faculty members, staff, graduate and undergraduate student volunteers can make it possible. We are also expecting guests and visitors. In addition, we are organizing a professional development event for physics teachers, who are accompanying their teams. This year we are going to discuss the challenges of the new British Columbia science curriculum. We hope it is going to be an exciting event. This is one of the traditions on UBC campus, I am very proud to be a part of. I am looking forward to it. Faber Residency Pedagogical Innovation Residency participants during February 2019. I have heard about Faber Residency from a colleague, who was a Faber resident in 2018 and recommended me to apply. At first, I dismissed this idea. Being a scientist and a science educator, I have never heard of residencies for people like me and I was not sure it would be something relevant to my work. I have attended multiple conference and workshops, but residences? And a residence for people from multiple fields and walks of life who are not science educators? From my experience as a university professor, we often live in silos and have limited opportunities to collaborate or even discuss our work with colleagues outside our Faculty or even outside of our offices. So initially, I wasn’t sure how beneficial it would be to spend time with the people whose academic interests and professional experiences might have very little overlap with mine. And yet, the Faber’s beautiful web site and the overwhelmingly positive feedback from the past Faber residents, as well as prompt and friendly responses from the Faber staff convinced me. I am very interested in pedagogical innovations and wanted to learn more from international colleagues. I also wanted to get to know Catalonia. So this session attracted my attention and I decided to apply. Fortunately my application was successful. Faber was a big surprise for me. First of all I felt welcome. Mrs. Gavina Freixa made sure that we felt here at home and the staff at the Residence was very helpful. Mr. Francesc Serés, the Director of Faber, not only welcomed us, but shared with us his love for Catalonia, local culture and traditions. Being invited to a beautiful place with a rich culture and history is very inspirational. This also inspired us to explore Olot on bike. 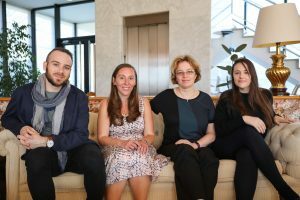 Second, I also feel very lucky that during my stay I was able to meet very inspirational people: a journalist – Erica Buist (UK), a poet – Kristina Marie Darling (US), a theater artist (US) and a learning designer Jacob Watson (US), and an educational researcher Tabia Kolympari (Greece). Coming from different countries, cultures and walks of life and having an opportunity to spend some time together in an informal environment is very rare in a modern world. And I am very grateful for that unexpected opportunity. A unique change to meet with colleagues outside of my own field in such an informal and beautiful environment proved to be very special and extremely beneficial. The freedom I was given to work on my own projects without interruptions was something I haven’t had in years. As university faculty members we are often overwhelmed by teaching, committee responsibilities, and other work that draws us away from our research. To be creative one has to have time to reflect, to ponder, and to slow down. This is a gift that is rare in a modern world where we are always rushing. Faber gave me this gift and it was not surprising that by the end of the Residency I have finished a number of projects I have been struggling with for months. Finally, I would like make a personal note. It is my third time visiting Spain, but the only first time visiting Catalonia. However, it is my first time where I was able to have some informal interactions with the local people. Thanks to our walks in nature and Francesc’s tour of the small towns near Olot, I had an opportunity to get a different prospective on this beautiful part of the world. I found Olot to be a very special place and I know that when I come back to Canada I will be paying a much closer attention to Catalonia, as this a small part of my heart will be left there. I hope I will be able to come back and I would like to express my gratitude to the wonderful staff of Faber Residency Olot and to the beautiful gift of Faber Residency they have given us. I am very fortunate to be teaching an online course that explores modern educational technologies and their influence on learning. The most exciting thing about the course for me is not that I am teaching it, but I am learning with my students. They are experienced mathematics and science educators who know so much and always make interesting points. 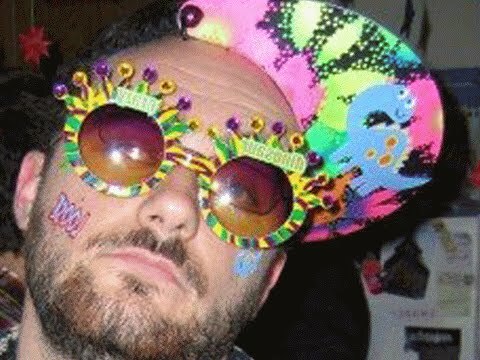 This is the video that they shared with me. I found it very interesting and relevant. I am currently teaching an online graduate course on creative use of technology in mathematics and science education. However, as we discussing technology use and mathematics and science teaching and learning and in teacher education, we inevitably come back to these questions: What does it mean to KNOW? What SHOULD our students know? WHY should they know it? and most importantly, What do they REALLY know and can put to use after our courses are over? As much as my course is about innovation in mathematics and science education, these questions are very old. In addition, since it is an online course, we have a luxury of having a Discussion Board where people can post thoughtful responses and share resources. So one of my students today shared this video clip with us. 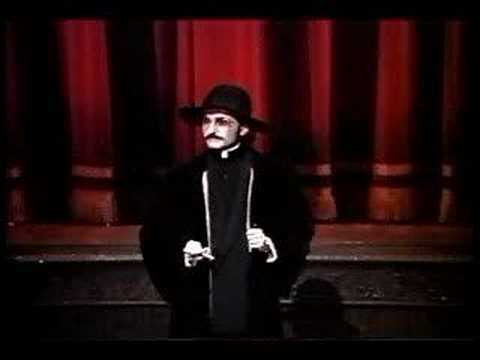 I didn’t know about “Father Guido Sarducci“. But I think his 1980s skit is right to the point. It is relevant almost 40 years later. While the Father didn’t answer our questions, he made us think about them again… So what are we doing today? Are trying to use novel pedagogies to make a 21st century Five Minute University or are we changing the entire system? Each one of us, mathematics and science educators has to find our own answer to this question. I definitely know mine. Last December I was interviewed by Lisa Keller from the Canadian Association of University Teachers. Lisa wanted to hear my view on the Matilda Effect and what in my view is going on with women in science today. Most importantly, she wanted to hear how current situation it is reflected in science teacher education. 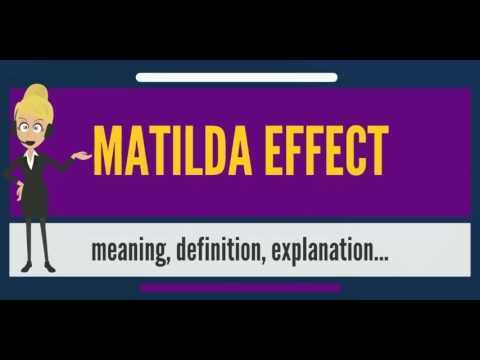 The interview came out today: https://www.caut.ca/bulletin/2019/02/matilda-effect. What is inside the marshmallows? Today I had an opportunity to do a school visit with the Scientists and Innovators in the School organization. I volunteer there and try to visit about ten different classrooms every year in order to engage kids with science. I especially try to visit schools in which the children might have fewer opportunities to visit The Science World or other museums. Today, I visited a few special education classrooms in our local Vancouver school. The teachers explained to me the challenges of teaching these kids and warned me that the kids might not be very engaged. I decided to try anyways. I can only say how happy I was to see how engaged they were. One thing especially touched me. I had lots of experiments with me. At one point, I was explaining to them an experiment with marshmallows as shown in our video. 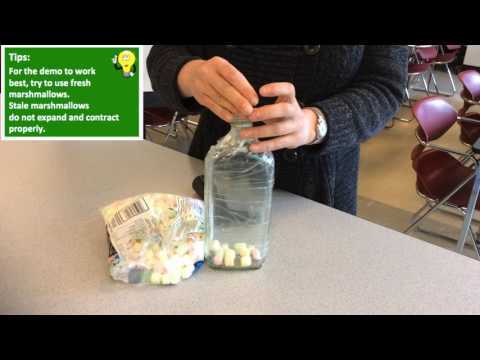 When we discussed the experiment, I asked them – what is inside the marshmallows? I expected the answers, such as air, sugar, etc. Instead, one of the girls who was watching the experiment very carefully responded – yamminess… and then they proceeded to explain why the marshmallows got bigger when we pumped the air out. So it was a lot of humour, laughs and joy. This was so-so cute and touching. I am glad I was able to reach out to these kids and I really appreciate their amazing teachers.